There’s no good way to say this: Skulls exhibiting fractures consistent with an exploding brain. During the Mount Vesuvius eruption of 79 AD, clouds of superheated gas enveloped the ancient city of Pompeii and its surrounding areas, instantly vaporizing bodily fluids and soft tissues, according to new research. Sounds grim, but this mode of death was actually a blessing in disguise, given the alternatives. Death came in any number of ways when Mount Vesuvius erupted on that fateful August day back in 79 AD. And in fact, many Roman citizens likely died before the eruption even happened. In the days leading up to the explosion, a series of earthquakes rocked the bustling city of Pompeii, toppling buildings and other structures. Many of the survivors, recognizing the signs of an impending volcanic explosion, wisely chose to flee the city (perhaps as many as 90 percent of Pompeii’s inhabitants evacuated). When Vesuvius finally erupted, it threw a massive column of molten rock, scalding ash, and pumice into the sky. Within minutes of the explosion, this debris started to rain down hard and fast, causing the roofs and floors of structures to collapse. Some unlucky citizens were struck down by boulders or the debris from collapsing structures. The eruption prompted a second wave of evacuations, but with a vastly shorter window of opportunity. Over the next few hours, the remaining inhabitants of Pompeii, including those living in the nearby settlements of Herculaneum, Stabiae, and Oplontis, were overwhelmed by avalanches of gas and dust, known respectively as hot surge clouds and pyroclastic flows, pouring down quickly from the mountain. By the time the two-day eruption was over, nearly 2,000 people had died. That fast-moving pyroclastic flows of gas and ash killed scores of people during the eruption is well documented. During the Vesuvius eruption, six distinct surges hurtled through a region extending for 18 miles (30 kilometers). The first of these surges, known as S1, consisted of the superheated gas cloud. The authors of the new study, led by Pierpaolo Petrone from the Federico II University Hospital in Naples, Italy, say many of Vesuvius’ victims were killed before the subsequent ash-filled pyroclastic flows reached them. Previous studies have shown the same thing, citing “thermally induced fulminant shock” as a typical cause of death, as opposed to getting slammed by a wall of ash, suffocating, or getting clobbered by a boulder. As a term, thermally induced fulminant shock isn’t very descriptive, even if it does sound dreadful. But that’s where the new study, published recently in PLoS One, has new things to offer. 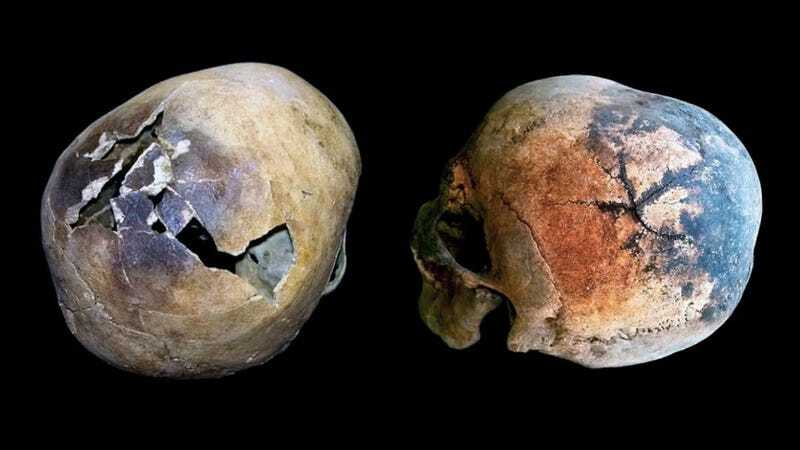 The superheated surge clouds vaporized the flesh and bodily fluids of victims in an instant, the researchers say, producing a gruesome effect in the skull, causing it to crack and explode. The remains of a child (left) and a young adult male (right) from the Herculaneum site. The postures of the body suggest instant death. The evidence for these claims comes from an archaeological site in Herculaneum, which like Pompeii, was completely buried in ash and mud after the eruption. Soon after Vesuvius erupted, around 140 citizens sought shelter in a dozen boat-chambers, or houseboats, on the town’s beach. None survived, but the occupants of these impromptu shelters were spared from the incoming ash avalanches, resulting in “the exceptional preservation of fully articulated skeletons” still in their final death pose, the authors write. This site was discovered back in the 1980s, and it been the subject of intense study ever since. It’s generally believed that the hundreds of people stranded on the Herculaneum beach were overcome by the extreme heat. The refugees in the boat-chambers, it has been argued, died from asphyxiation after the concrete-like ash smothered the shelters. The new analysis suggests this wasn’t the case, and that, like the people on the beach, these victims were also killed by the heat. The smoking gun for this claim comes in the form of red and black residues found on the skulls and other bones of the victims inside the boat-chambers. Petrone and his colleagues analyzed over 100 samples found at the site using Raman microspectroscopy and Inductively Coupled Plasma Mass Spectrometry (ICP-MS), which can detect the presence of minerals at exceptionally low concentrations. The red and black residues contained unusual amounts of iron, which the researchers say is consistent with blood. Red and black mineral residues were found outside and inside the victim’s skulls. In the present work, careful inspection of the victims’ skeletons revealed cracking and explosion of the skullcap and blackening of the outer and inner [layers of the cranial bone], associated with black exudations [i.e. when liquid pours out] from the skull openings and the fractured bone. Such effects appear to be the combined result of direct exposure to heat and an increase in intracranial steam pressure induced by brain ebullition [boiling], with skull explosion as the possible outcome. After the organic liquids in the brain evaporated, the brain was almost immediately replaced by a chunk of ash. An “ash cast” was found in all victims, including those who displayed minor heat effects, providing “evidence that the S1 surge was sufficiently hot and fluid to penetrate the intracranial cavity soon after soft tissues and organic fluids disappeared,” the authors write. In terms of temperatures reached, the authors estimate somewhere between 400 to 500 degrees Celsius (750 to 930 degrees Fahrenheit) . The phrase “rapid replacement of flesh by ash” is certainly as poetic as it is horrifying. The authors use an array of tools to demonstrate their case, while paying close attention to previous work done in this area. If there is a shortcoming of the study, however, it’s the analysis of the red and black minerals. The claims being made are so extraordinary that, ideally, other teams would replicate the findings and make sure the iron (if that’s what it is) isn’t coming from somewhere else (e.g. coins and other metal objects found within the chambers). It would also be good to see if another team agrees with the morphological analysis done on the skull and bones. To this day, Mount Vesuvius remains an active volcano, and it’s located a mere 8 miles (12 kilometers) from Naples, a large Italian city populated by 3 million people. It’s estimated that Vesuvius experiences a major eruption once every 2,000 years or so—a troubling tidbit of information, given that it last erupted 1,999 years ago. Now, that doesn’t mean an explosion is imminent, but it is a cause of serious concern. Fortunately, local officials have an emergency plan should the worst happen again.